CooLingerie: What Kind of Wedding Dress Style Would You Like to Choose? What Kind of Wedding Dress Style Would You Like to Choose? Wedding dress can generally divided into the following four styles: Simple, Romantic, Gorgeous, and Elegant. Come and take a look, which style do you belong to or do you like to choose? Compact outlines often express a wearer's characteristics. How to use simple lines to emphasize their advantages, is the key point that should be noticed for simplism brides. Exquisite tailoring and high-grade fabrics are the strong points of simple wedding dresses, which would be a very perfect reflection of dress’s quality and grade. The brides who pick these kind of wedding dresses can definitely stand out in the crowd. Thus these simply designed dresses are very suitable for a girl with strong sense of independence. I bet most people especially girls would come up with the word “romantic” immediately when it comes to marriage. Then how to create a that natural and romantic feeling on a wedding dress? The answers are various. Hollow lace, transparent ruches embroidered with small floral, tiered fluffy draped skirt, as well as airy long wedding veil. All these factors and designs are the perfect embodiment of the romantic style wedding dresses, which could match well with girls who love culture and arts. 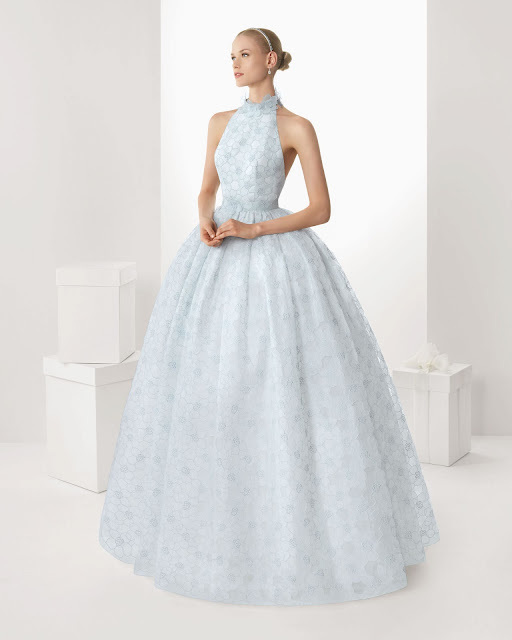 This amazing light sky blue ball gown wedding gown undoubtedly catch all people's eyes. Unique jewel neck design with delicate applique reveals a fancy feeling. Big ball gown skirt cascading down to floor-length hem, creating an astonishing view. The most noticeable part is the dreamlike lace covered all over the entire dress. Admittedly, ornate style will always be awesomely eye-catching, while at the same time highlighting the noble sense should not be forgotten. So bear in mind that the basic principle of gorgeous style is good matching. Complicated hand-sewn skirt with layered dreamy hem make a fantastic French palace-style wedding dress, which fully demonstrates your graceful disposition. Romance and grace are fully illustrated in this pearl pink A-line wedding gown. Deep V-neckline gives out feminine charm with exquisite lace adding more glamour. 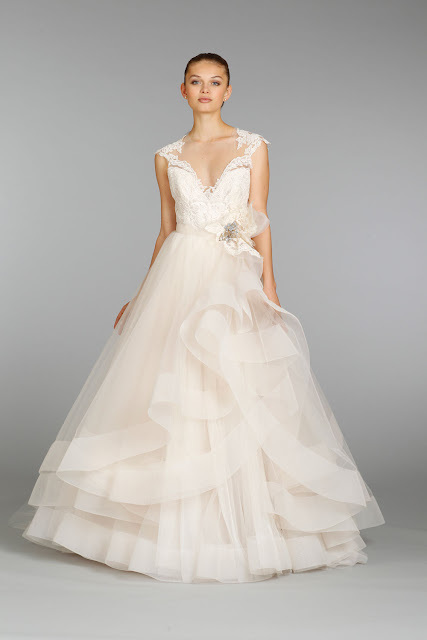 What the most sparkling part is the dramatically overlapped organza skirt, transparent and soft. Vivid handmade lace flower decorated by dazzling crystal ornament accents the natural waist. This is the most common image of a beautiful bride shows. As long as you dress up properly, no more exaggerated embellishments or accessories are need because just the simple raw materials can present the bride’s most perfect state. 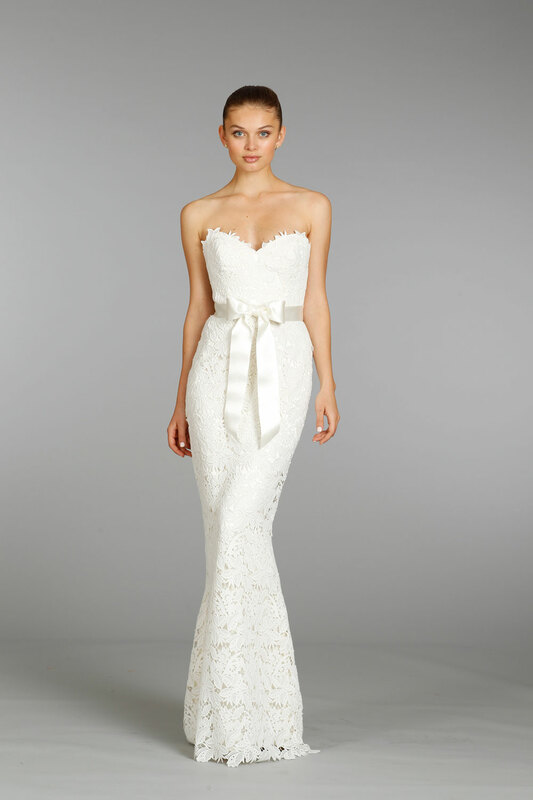 Speaking of elegance, no dress can outweigh the sheath lace wedding gown. Formfitting design shows ravishing women curves with classic sweetheart neckline. A stylish silhouette plus a piece of sophisticated lace can make a beautiful wedding dress. In addition, a simple elastic sash or a luxurious crystal waistband adds brilliant to what is already splendid. In a word, dress style and personal characteristics are inseparable. Whether simple or romantic, gorgeous or elegant, the most suitable one is the best. Then, do you find the desirable style just for you?